Our shop provides custom framing to enhance and protect your artwork. All of our work is done with conservation and/or archival materials and methods, unless you specify otherwise. We specialize in unique and custom solutions for your artwork, especially for three-dimensional objects. We offer home and office consultation as well as pick-up and delivery services. Please take a few minutes and browse our gallery pages, which give you a small sample of the work we do. The best way to experience our personal attention and service is to stop by the shop during regular shop hours. We offer truly unique, custom frames made especially for your artwork. Many of these frames would be considered works of art by themselves. 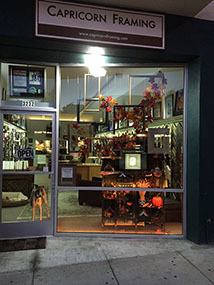 In July 2012, San Francisco Magazine named Capricorn Framing '2012 Best in the Bay Area' frame shop. Come in and find out why.